As anyone who works with junior and Under-23 riders will know, trying to get young riders to put 'pen to paper' and keep sponsors and supporters updated with their performances is well-nigh impossible. Perhaps fines are the way ahead, or punishments (washing team bikes?) might motivate them? In any case, having been given a 'gentle' nudge by coach and manager Neil MacLeod, some of the supported riders have finally been motivated to recount their performances this season. "My main races in 2015 were at the Special Olympics World Games in Los Angeles at the end of July. I was racing for the Great Britain team in three races, a 25km road race, a 15km road race and a 10km Time Trial. In my first race which was the 25km RR I had a crash with another rider and fell off my bike. I managed to get back on and raced back to the leaders. I sprinted hard at the end but was beaten by a rider from Ecuador and won the silver medal. In the 15km race I won silver again but after a mistake with the timing in the time trial I was only given 4th place. At first I was disappointed not to win a gold medal but in the end I was happy with my silver medals. Being in LA with the Great Britain Team was amazing and it was a great experience. Racing at home has been much harder. I have been racing in the WoSCA Development races but have found it really hard racing in a much bigger bunch at a faster speed. I really enjoy it and hope with more training and more racing I will be able to do better in these races but also get stronger to win gold medals at my Special Olympics and disability sport races." The first race for a new team is always something which makes you a little apprehensive, especially when it's a senior national championship. However I also saw it as a mixed blessing, as we Glasgow Cycle Team riders were joined on the start list for the team sprint by a Commonwealth Games competitor and a former world masters champion, something that took a little bit of the burden of expectation off my shoulders. The morning before the event was quite calm, sitting around with my new team mates and getting all the equipment in order. The twist came when we were told by the organisers that we were racing in ten minutes having done no warm up ourselves, meaning before I knew it I was on track being given a countdown having only had a quick blast on the rollers. I think was another blessing as it gave me no time to panic or fret, leaving me only enough time to focus on the job at hand. The race was over and done with soon enough in a flash of pain and all out effort. It went well I think, we rode a technically good race, because it's hard to get the timing and the efforts right. Regardless its onwards and upwards onto the next one! Over the season I have had a heavy track focus, with the Junior iDevelop programme shaping the way of things to come at the start of the season. Over the last few months, the major track competitions all took place. 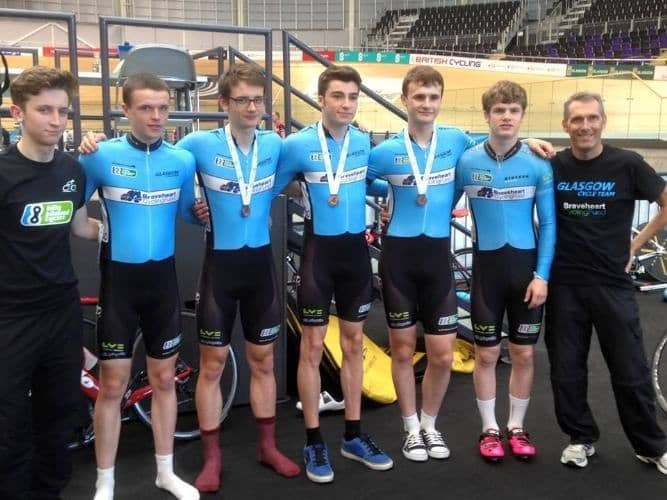 First off was the Scottish Junior Track Championships. I was happy to come away from the event with two medals: a bronze in the Kilo TT and a silver in the Keirin. I struggled in the endurance events - a holiday with no bike time wasn’t ideal - but I was still satisfied with my achievements and my disappointment in the endurance side was ideal motivation for the British Junior Track Championships. Five of us travelled down to Manchester for what would be my first British track event. It amazed me how different the velodrome was in comparison to Glasgow. The track felt much narrower and the banking’s felt a lot less steep, so it was a great experience to simply ride in a different velodrome. The first event was the Kilo TT, which I managed to PB in with a time of 1.08.985. The following day in the 3km Individual Pursuit, I achieved another PB with a time of 3.46. Furthermore, Angus won the bronze medal and there was a great atmosphere within the team. In the points and scratch races my aims were to compete as much as possible and enjoy the experience of riding with some top juniors. I didn’t qualify for the finals but enjoyed the racing and was pleased to see Andy take the bronze medal. Next up was the Scottish Senior Track Championships. I didn’t manage to PB in the Kilo TT, however I did experiment in using a bigger gear than the previous championships. I also rode my first 4km IP, the extra kilometre making the effort harder to judge. My time wasn’t great but the experience was worthy for next year as a senior. In the team sprint, Andy, Angus and I took the bronze medal on the third attempt in the bronze ride off after a series of false starts and foot pulling. Afterwards on the podium, our body shapes looked very out of place next to Glasgow Sprint Team and Edinburgh RC... I struggled in the points but was satisfied with my first senior championships! I would like to thank Neil, our sponsors and the SC coaches for their support during these events.